The return of the rep-mobile. Peugeot are feeling really confident right now. 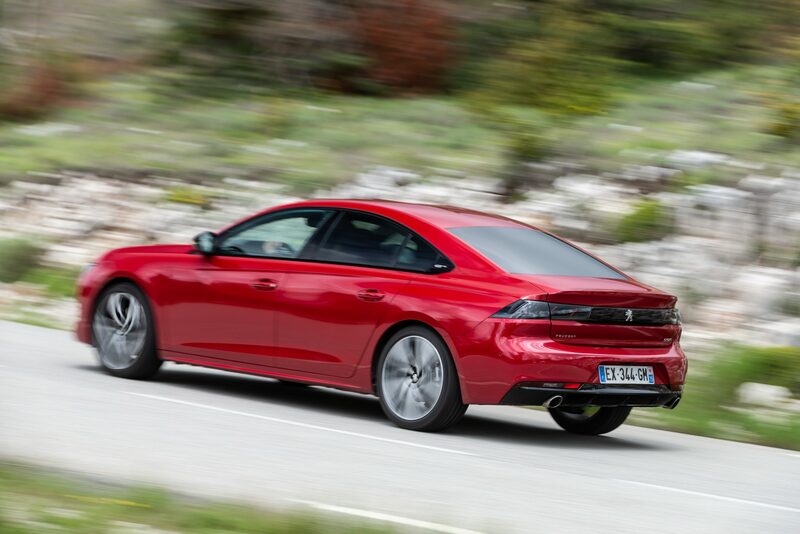 Spurred on by the success of their 3008 & 5008 SUV’s, the French brand has spent the past five years developing & now launching it’s all new 508, a saloon car into a world that’s been taken over by SUV’s of every conceivable size. This is without a doubt a brave move, but at the launch recently in Monaco the Peugeot hierarchy were bullish about their new baby, pointing out that they were aiming it below the premium German brands, with the goal of being the best high end brand of the rest. These are brave words indeed, but with their year on year sales on the up in an ever declining market, perhaps Peugeot have a right to be positive about this new car. 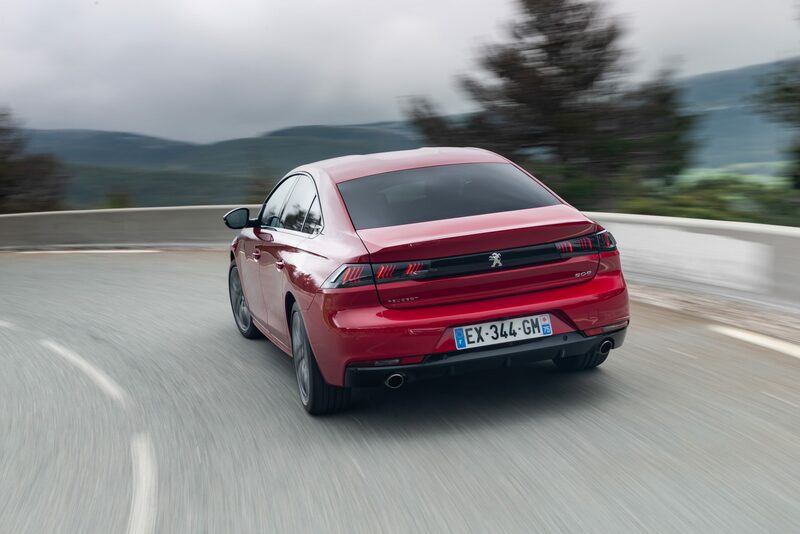 The UK is set to be the third largest European market for the 508, where Peugeot see it very much as a B2B proposition. With retail sales dominated by crossovers of all shape & size, SME fleets here are very much on the agenda for the Coventry based company. Both China & the US will be important markets for 508 as well. Available from launch with a range of petrol & diesel engines, both a hybrid PHEV & EV models will follow in due course, with Peugeot realising that despite the logic of diesel for business, petrol & especially plug-in models are a necessity for them to compete in an ever changing world. BlueHDi 130 S&S 6-speed manual, which is the entry-level engine and the only one offering a six-speed manual gearbox, BlueHDi 130 S&S EAT8 auto, a BlueHDi 160 S&S EAT8 auto & a BlueHDi 180 S&S EAT8 auto. Realising that customers now expect their car to be bang on trend with tech, practical as well as attractive both inside & out, Peugeot’s design team have created a clever hybrid of the best looking German saloons, think BMW 4 Series Gran Coupe & Audi A5, with a touch of Gallic style, for this new 508 is definitely a cat-walk contender. The 508 is no longer on the outside looking in, it’s a fashionable ‘fastback’ which now offers a genuine alternative to the Teutonic trio. 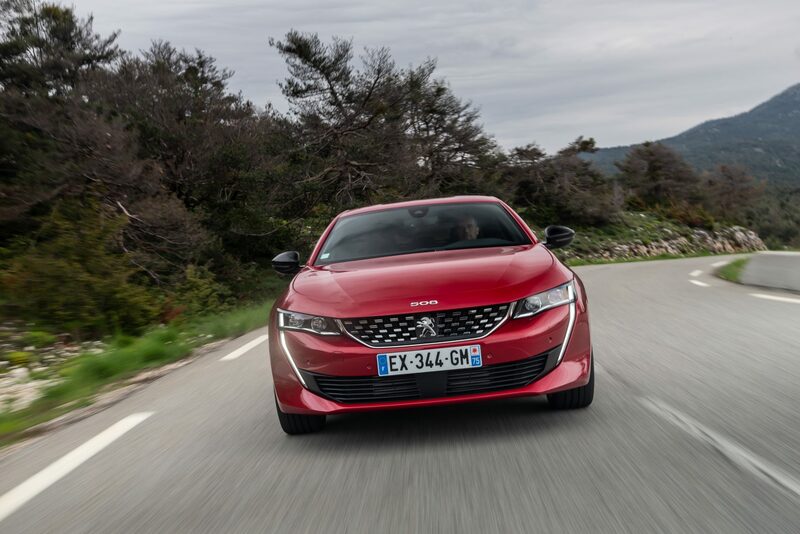 The new model’s front end features a finely fashioned radiator grille with chrome- plated chequerboard, full LED headlights, with the famous lion centred on its radiator grille & the 508 logo upon the nose of the bonnet. The car appears more compact & it is, 4.75m long ,vs 4.83m of the outgoing car. The low glazed surfaces further sharpen the car’s outline & reveal frameless doors. Spanning the rear end & framed between the rear lights is the glossy black horizontal strip that now characterises Peugeot’s latest vehicles & three- dimensional full LED rear lights which are illuminated throughout the night & day with adaptive intensity, making Peugeots coloured claws constantly visible. The car’s designers have also massively improved the interior as well. The familiar i-Cockpit dashboard layout from the 3008 & 5008 has been adapted to the saloon, offering an almost wraparound drivers seat between door & centre binnacle. 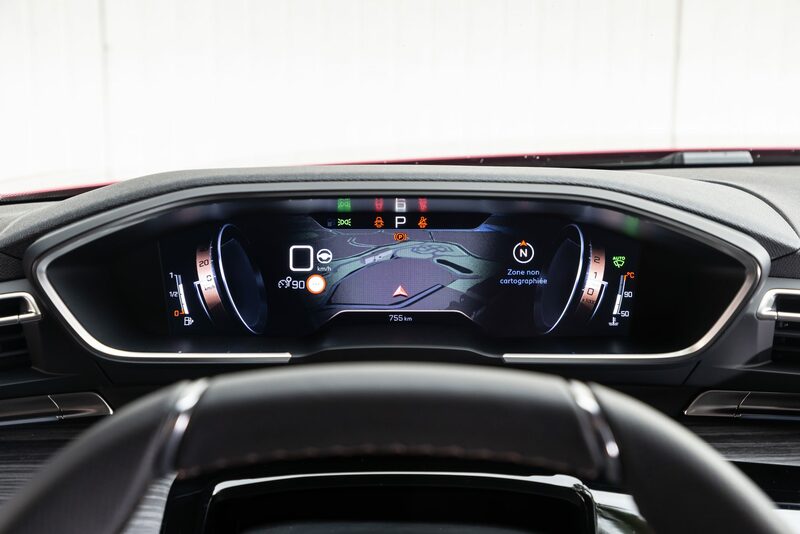 The small steering wheel is also there plus a large 10″ wide HD capacitive touch-screen in 8:3 forma & a head-up display unit with a high-resolution 12.3″ digital screen. We tested an automatic model, as only the entry-level diesel uses a manual gearbox. Basic Active cars get an 8″ capacitive touchscreen, with Allure & up benefitting from a 10″ HD display. The temperature & fan controls are hidden within a sub-menu in the infotainment system. Luckily, for slow learners, everything can be accessed via the intuitive piano key shortcut buttons, an addition on 3008 & 5008 as well. To be fair, all 508’s come fairly well equipped. Active features 3D connected SatNav, DAB radio, automatic lights & rain-sensing wipers. Allure adds ambient lighting, heated faux-leather seats & a reversing camera. Safety is on line too, with all models offering autonomous emergency braking & Lane Keeping Assistance (LKA) Choose Allure & you also get Active Blind Spot Detection road sign recognition and Driver Attention Alert. GT- Line & First Edition models, we drove the GT- Line, which are only available with the most powerful engines, come with wireless phone charging, 18” wheels & LED lights. The interior features leather seats, with contrast stitching, aluminium pedals & top quality finish that will give the Germans a run for their money. The connected equipment in the new 508 includes Mirror Screen compatible with the Android Auto, Apple CarplayTM and MirrorLink®, with off-board voice-recognition via smartphone & induction-based smartphone recharging ( for devices compatible with the Qi standard) The PEUGEOT Connect pack includes 3D connected navigation with TomTom® Traffic. Being a fastback, internal space especially in the rear is slightly compromised, with rear head room taking a hit. The cabin does boast 32 litres of storage, spread out around the passenger cabin, as well as four USB sockets to charge portable devices, which are available from Allure trim & above, one jack plug in the armrest & two 12V sockets, including one in the boot. In the boot which at 487-litres, is actually 14 litres bigger than before, while the hatchback tailgate will make loading bigger items much easier. Peugeot also claims a total of 1,537 litres with the rear seats folded flat, with room for a spare wheel under the boot floor. We had the chance to drive the GT-Line specced model on the motorways around Nice & up & into the hills between Grasse & Monaco. When you walk up to the 508 it looks stunning, always an important consideration for UK fleet customers.The cabin feels top-notch & driver- friendly & I managed to get comfortable in the electrically adjustable drivers seat quickly. Before I set off, I connected my i-Phone seamlessly with Apple Carplay. Our route had been pre-set & the navigation proved capable. Having holidayed in the Cote D’Azur several times, I knew the roads & the routes well & put my foot down on the winding roads as we climbed towards Valbonne. The ride can best be described as supple, handling bumps with aplomb & taking in sweeping curves equally well. The eight-speed auto box made light work of the inclines we encountered & the 508’s low centre of gravity means that there’s little or no body roll. The small steering wheel adds to the dynamic feel & as I approached the motorway I had enjoyed the trip. Riviera traffic is notoriously slow & on our visit congestion on the motorway only gave me a few kilometre’s to put the car through it’s paces. The adaptive cruise control was easy to set up & the 508 purred happily along at 120kmh. Our car’s 225bhp 2.0-litre diesel engine offered plenty of torque & if you opt for this engine, you won’t be disappointed. I would expect the 508 to be as happy on a long motorway journey as it was in the hills. In conclusion, I have to give it to Peugeot. They’ve taken a gamble by investing in a new saloon model, but by the power of Greyskull, they’ve produced a stand-out car, that deserves to do well. Once upon a time, no self respecting rep would be without their trusty saloon & perhaps, the new Peugeot 508 might make customer’s ditch that boxy, bland to drive SUV, for something a little more exciting. The Peugeot 508 went on sale in July 2018, with deliveries commencing in October. Prices range from £25,000 for the 1.5 diesel to £36,400 for the top-spec GT 2.0-litre.